The large Black Wood Rosary is perfectly sculpted for large hands or for those who have trouble feeling regular sized prayer beads. The black beads used in the design are smoothed and shaped to easily glide through the fingers as each prayer is said. The beads are generously spaced and are reinforced for years of comfortable use. The rosary includes a silver center medal and crucifix. The beads are connected with a matching silver chain. 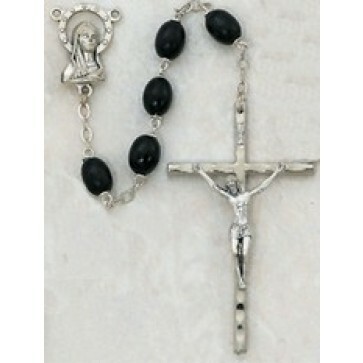 This beautiful rosary makes an excellent gift for any occasion.